For the telecommunications company based in Belmont, California, see RingCentral. The ring cent or holey cent was a one-cent pattern coin struck in various compositions and designs between 1850 and 1851 as part of an experiment on producing a cent with a reduced weight and diameter, as the rising price of copper had caused cents to cost more than their face value to produce. Many varieties exist, with differing designs as well as differing compositions, including billon (standard), aluminum, copper, cupronickel, nickel silver, nickel, silver, and white metal. 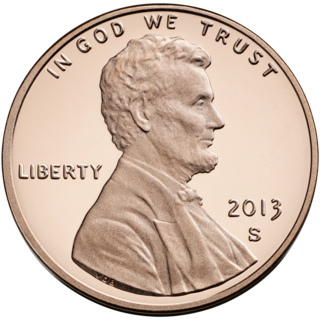 Contrary to its name, some ring cents were struck without a perforated hole, instead leaving an outline where the hole should be. This example, although it is stated to be "one tenth silver" is struck in copper. In the late-1840s, the price of copper had risen to the point that large cents cost more than one cent to produce. In response to a bill drafted in 1849 by Congressman Sam F. Vinton to reduce the size of the cent, the US mint began looking for an alternative type of cent. One solution to the problem was to perforate the coin in the center, creating a ring-like appearance. Pattern ring cents were first struck in 1850 in various test compositions. However, it was found that the coin was difficult to eject from the presses and that it was expensive to recover the silver from the alloy. Because of this, the ring cent was not placed into mass-production and the large cent continued to be produced until 1857, when it was replaced by the Flying Eagle cent. According to numismatic historian Walter Breen, another factor in the rejection of the ring cent was that it reminded many of the Chinese cash coin, which had minimal purchasing value. The ring cent was briefly revived in 1884 by Eastman Johnson, although this time the design was somewhat cruder as the holes appeared to have been handcut as they vary in both size and shape. Although a more refined and smoother design was struck the following year, no more ring cents would ever be struck. 196 ring cents (originals and restrikes) are known to exist. Patterns of this "ring cent" were struck in various metals and with various hole sizes. There were also various different designs, with some designs lacking a date or a reverse design. Some did not even have a hole, in its place being a circle resembling a line for perforation. These were known as annular cents. Obverse of the 1885 ring cent. All 1885 ring cents (with and without the hole) were struck with a die featuring a 5 over 3 overdate error. Reverse of the 1885 ring cent. 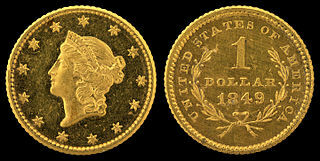 The 1850 blank non-perforated reverse was probably struck from the same die that was used for an 1852 gold dollar pattern. 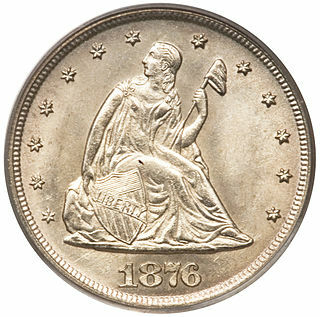 In the case of the non-perforated reverse, although they were dated 1850 (and thus used the 1850 non-perforated reverse), the coins were actually struck in 1853. ^ "J127/P149". uspatterns.stores.yahoo.net. Retrieved 2019-03-25. ^ "J1721/P1929". uspatterns.stores.yahoo.net. Retrieved 2019-03-25. ^ "1792-1856". uspatterns.stores.yahoo.net. Retrieved 2019-03-24. ^ a b "Annular - Holey One Cent Patterns". Retrieved 25 March 2019. ^ "J1740/P1950". uspatterns.stores.yahoo.net. Retrieved 2019-03-27. ^ "J124G/P145". www.uspatterns.com. Retrieved 2019-03-28. The two-cent billon was a pattern US coin struck in 1836 and initially proposed as part of the Act of January 13, 1837. 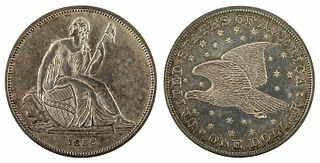 Versions exist with either a reeded edge and coin orientation or a plain edge and medal orientation; however, those with the former tend to be original strikes, whereas the latter are always proof restrikes. The Washington nickel was a pattern coin originally intended as a proposed design for the copper-nickel United States five-cent piece, struck in 1866. Designed by James B. Longacre, various different types of designs exist, as well as in different metals. 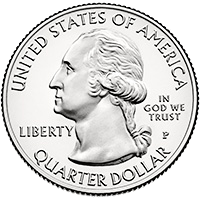 The design was eventually rejected in favor of another Logacre design, the Shield nickel, although the final design utilized one of the proposed reverse designs for the coin.